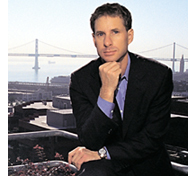 Chris Larsen, co-founder and CEO of the online lender E-LOAN, says his undergraduate days at San Francisco State University started with a simple goal. "Back then I just wanted to put my head down, work hard and make my parents proud," he says. Larsen has made SFSU proud, too, as evidenced by the honor he will receive at the May 29 Commencement: Alumnus of the Year. "Chris Larsen is a corporate leader with a conscience. He exemplifies the University's ideals of entrepreneurial innovation and ethical responsibility," said President Robert A. Corrigan. "As technology changes the way business is conducted, Larsen continues to meet new challenges while remaining strongly rooted in his principles. We are honored that San Francisco State University was the training ground for his career." Larsen says that E-LOAN, established in 1997 with Janina Pawlowski, was born out of a bad experience he had while applying for his own mortgage. E-LOAN eliminates the need for brokers and bankers and instead allows consumers to comparison shop for mortgages, home equity and car loans directly from the company's Web site. One of the rare Internet success stories, E-LOAN has sold more than $18.9 billion in consumer loans since its inception and has remained profitable for the past eight quarters. Focusing on who you are, your core values, and the reason you're in business in the first place leads to success, Larsen, 43, says. There should be "a uniform passion in everybody in the company." Born in 1960 in San Jose, Larsen grew up amid fruit orchards before the valley's high-tech boom. His mother was a freelance illustrator. His father was a United Airlines aircraft mechanic at San Francisco International Airport and a proud union man. "He was offended by corrupt management," says Larsen, adding that his father taught him to get angry when things aren't going right and to work for positive change. Larsen graduated from SFSU with a degree in international business and accounting in 1984, and went on to work for Chevron doing financial audits in Indonesia, Ecuador and Brazil. He later eanred an MBA at Stanford University. Describing himself as "radically pro-consumer," Larsen is among the state's most outspoken advocates of legislation to protect financial data -- bank balances, home phone numbers and other private information that financial institutions sell to outside firms without the consumer's permission. In 2001, after a bill sponsored by Assemblywoman Jackie Speier, D-Hillsborough, that would have provided greater privacy protection to consumers was defeated at the hands of pro-business legislators, Larsen refused to give up. He co-founded and funded with $1 million of his own money, Californians for Privacy Now, a coalition dedicated to protecting consumer privacy. Under his leadership, the coalition gathered more than 600,000 signatures in protest of the ruling, nearly double the number required to place the issue on a ballot for voters to decide. Armed with these signatures, Larsen stood up to lawmakers and financial institutions with deep pockets, demanding that they agree upon the privacy legislation or face tougher legislation on a future ballot measure. Financial firms withdrew their opposition and legislators no longer had reason to block the bill. Larsen's support was instrumental in the California Legislature passing the strongest consumer financial privacy law in the nation in August 2003. "I hold Chris Larsen in the highest esteem. He is a visionary and a man of action," says Speier. "Without Chris Larsen, California's financial privacy law, which sets the standard for the rest of the nation, would never have become a reality." Although he says there are financial institutions looking to undo the law completely, Larsen remains confident. "There will probably be another battle next year," he says. "But the banks are going to lose." His connection with his alma mater remains strong. "You get a great education," he says. "And it really is the bargain of the century." Back in his student days, Larsen made a promise to himself that once he was established in the business world, he would find a way to thank San Francisco State. He made good on that promise several years ago when he established the Chris Larsen Scholarship Fund. Each semester the fund provides $2,500 each to 10 College of Education students studying to become teachers. Among his other contributions to the Bay Area community, Larsen and his wife Lyna Lam, owner of Café Panini in Berkeley, are also helping members of a Cambodian Buddhist community in San Jose, most recently in their effort to obtain a space to build a Buddhist temple.